The Dolomites, a UNESCO’s World Natural Heritage site since 2009, are one of the world’s most fascinating mountain ranges. Once known as “The Pale Mountains” for the white color of their rocks, the shapes of these majestic peaks have often been compared to natural cathedrals, pinnacles and needles – a fact evocative of the almost religious sense of wonder that these mountains have instilled on men over the centuries with their superbe grandeur. The best period for visiting and photographing this area is from mid May to mid October. In May and June the fields are green and dotted with flowers, and trees are blooming, while in the weeks across September and October fall foliage colours reach their peak. However this region is so impressing that also in less ideal seasons will provide the conditions for unforgettable holidays and photographic tours. A small lake, just slightly bigger than a pond, Lake Antorno is without any doubt the best vantage point for photographing the Tre Cime di Lavaredo (Drei Zinnen in German) either at sunrise or sunset. The Cadini di Misurina group and Mount Piana are also visible from this place. I took this picture on beautiful clear evening of mid June, this image is stitched from four vertical frames. 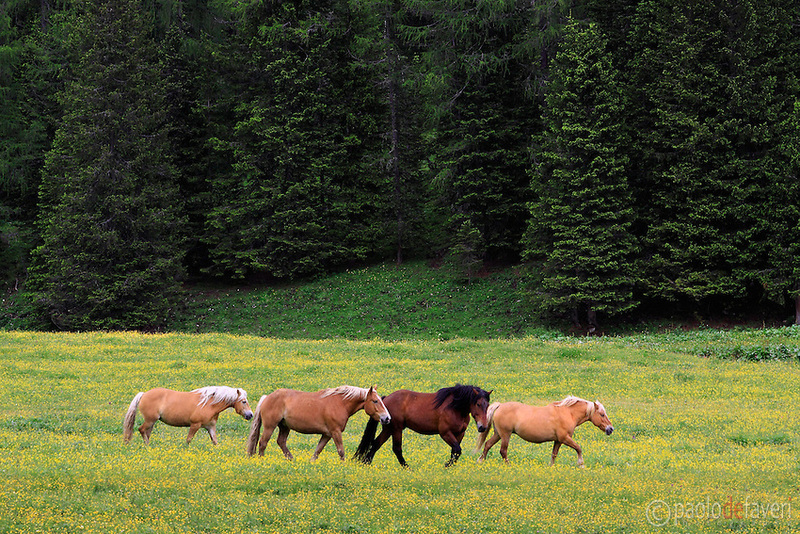 Wild horses in the fields surrounding the Lake of Misurina, in the Dolomiti d’Ampezzo area. Many wildlife species live in the area of the Dolomites, such as deers, chamoises and ibexes, foxes, wolves and brown bears. Croda da Lago and Lastoi de Formin as seen from the Cinque Torri. 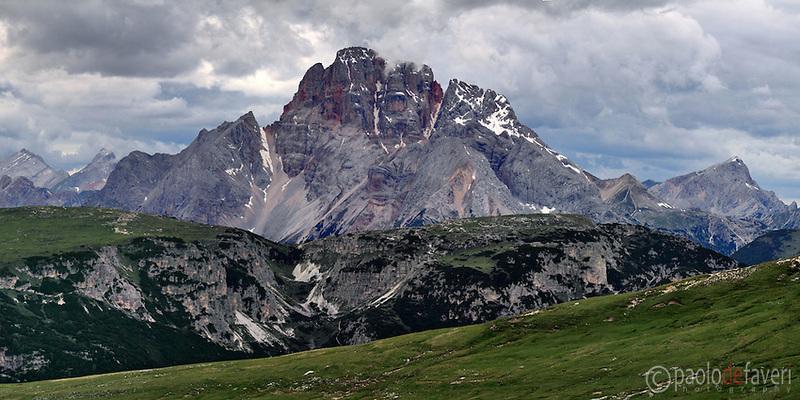 Taken at sunset from the fields surrounding the Cinque Torri group, a small massif of five peaks in the Nuvolao range, not far from Cortina d’Ampezzo. This area was theater of fierce fightings between Italian and austro-Hungarian troops during World War I; the trenches and shelters are still there nowaday and have been recently restored to create interesting historical itineraries. The Castle and the small village of Arnaz (Schloss Buchenstein) nearby Livinallongo, with the peaks of the Settsass/Conturines range in the background. 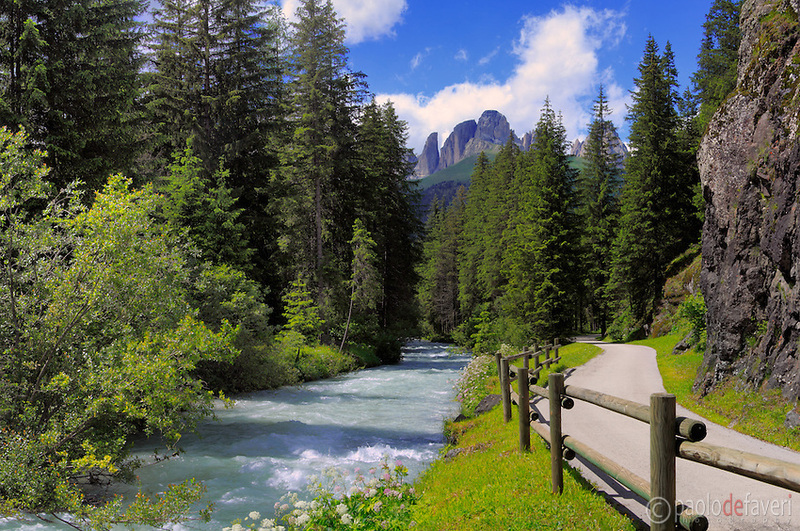 The Dolomites are not only about majestic peaks and ranges. 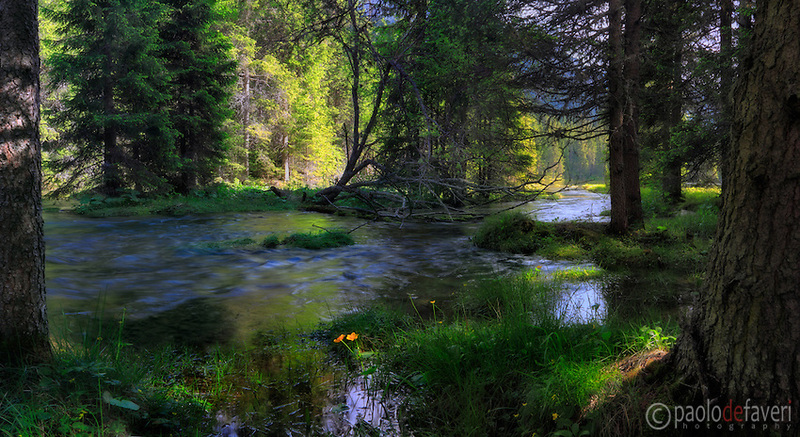 There are also many beautiful forests, streams and lakes. This is Lake Ru Freddo, a small lake at the feet of Croda Rossa d’Ampezzo. A view of the amazing peaks known as Sasso Lungo and Sasso Piatto as seen from the small town of Canazei, with the rapids of Rio d’Antermont in the foreground. 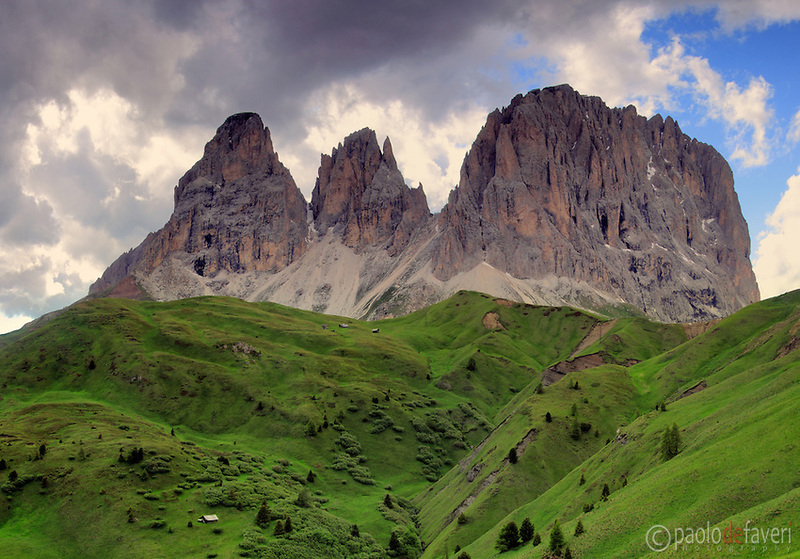 The jagged rocky peaks of the Dolomites known as Sasso Lungo and Sasso Piatto, emerging from the green prairies of Passo Sella, an high altitude pass linking Canazei to Selva di Val Gardena. 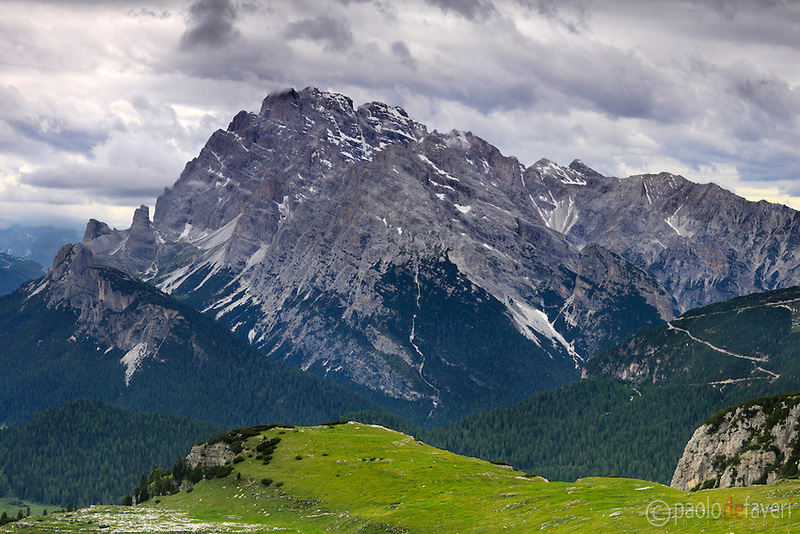 Monte Cristallo, one of the many massifs in the dolomiti Bellunesi, under some ominous clouds. Taken about 1 hour before sunset on an evening of mid June, from the plains surrounding the Tre Cime di Lavaredo/Drei Zinnen. 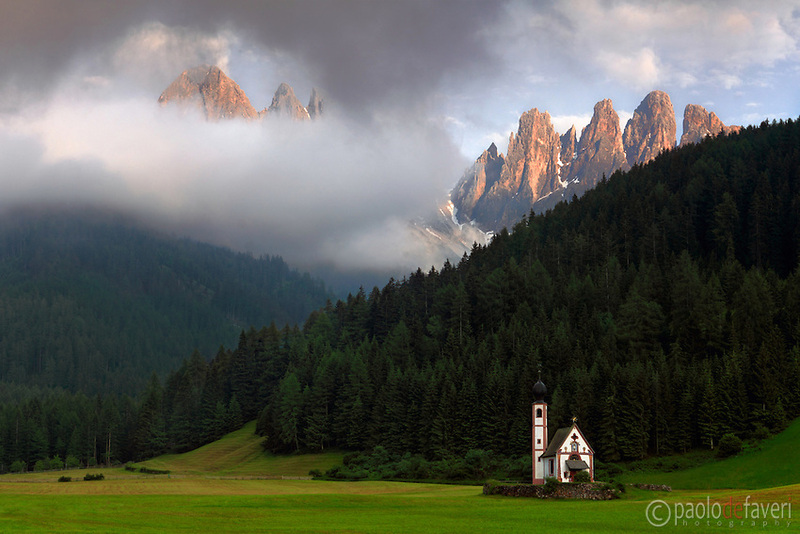 A classic view of the Odle range, an amazing dolomitic massif placed at the top of Val di Funes/Vilnosstal in Alto Adige/South Tyrol in Italy, with the small, wonderful chappel of Saint Johann in the foreground. It had be rainy and overcast most of the day, but the sky cleared off right in time for sunset, contributing a unique drama and mood to this stunning scenery. 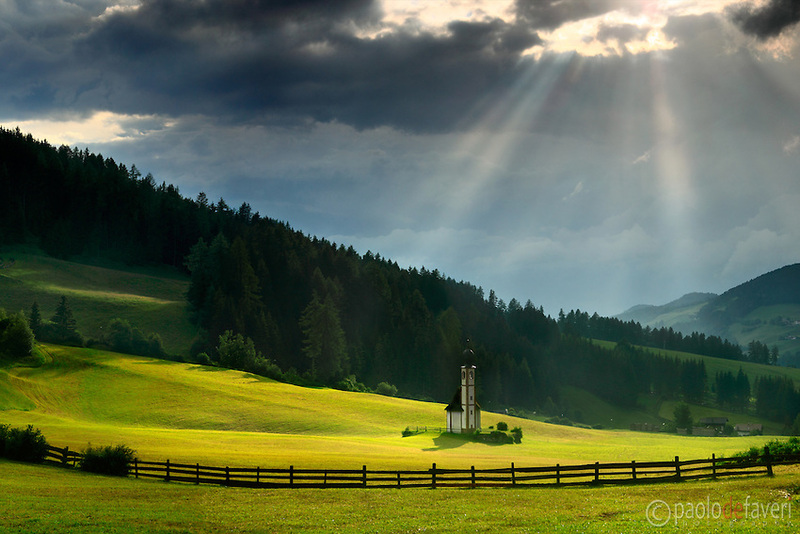 Some suggestive sun rays hit the small chappel of Saint Johann and the surrounding grass fields, as the sky starts to clearing-off after a mighty summer thunderstorm. 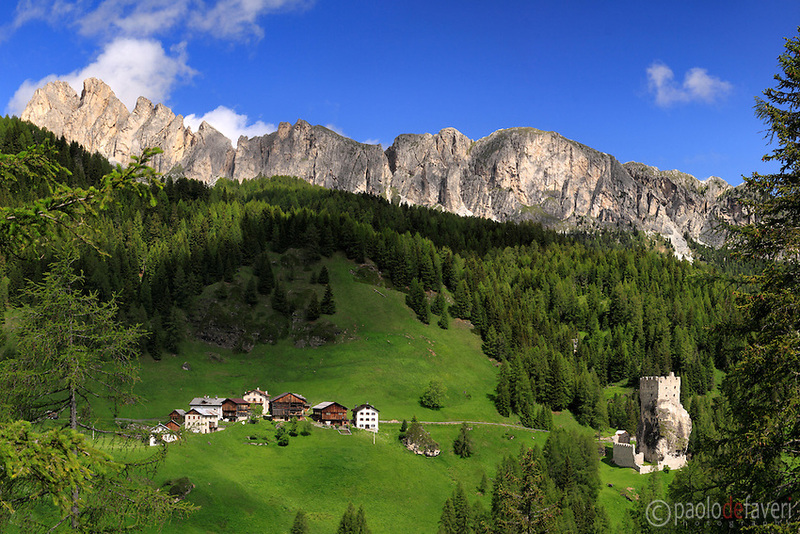 Taken at the top of Val di Funes on an evening at the end of June, this is stitched from five vertical frames. Just another amazing peak of the Dolomites, known as Sass de Putia (Peitlerkofel in German) and it’s placed exactly at the intersection between Badia and Funes valleys at Passo Erbe, in the region of Alto Adige/South Tyrol, Italy. It looks very steep and jagged from this side, and this sounds very funny because actually this is one of the easiest climbs in the entire Dolomites, if you take the trail from the opposite side. 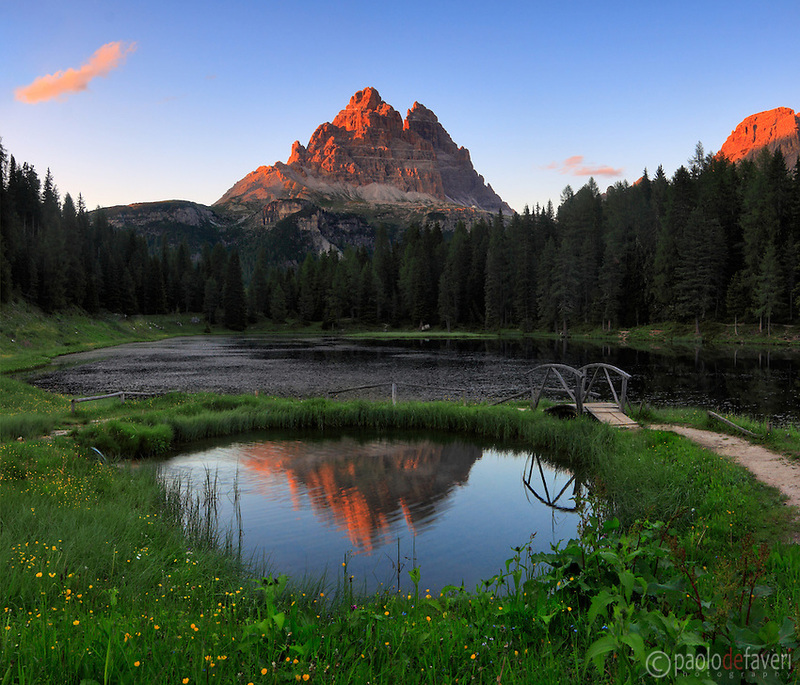 A flaming sunset at Lake Antorno, with the groups of Tre Cime and Cadini di Misurina in the background.